We believe that a formal and systematic effort to evaluate the work of Robert B. Brandom in the light of Wittgenstein’s philosophy has long been overdue and is urgent. We therefore have proposed to set up a special edition about the question as to whether the philosophy of rational pragmatism, proffered by Professor Brandom, may be considered as an amplification of the account Wittgenstein himself gives of language as a human praxis. The special edition is scheduled for publication by the end of June 2018. We hope to define a list of contributors by the end of next September and shortly after that a table of contents along with extracts of the works included. Among the authors who have announced their intention to contribute to this volume, we are pleased to mention: Robert B. Brandom of the University of Pittsburgh, James Conant of the University of Chicago, Juliet Floyd of the University of Boston, Danielle Macbeth of the Haverford College, María José Frápolli of the University of London, Leila Haaparanta of the University of Tampere, Luigi Perissinotto of the Università Ca’Foscari of Venetia, Jeremy Wanderer of the University of Massachusetts, Paul Horwich of the University of New York and Simon Blackburn of Trinity College at the University of Cambridge. Disputatio. Philosophical Research Bulletin cordially invite philosophers interested in the topic to become part of the discussion we hope to set up, in order to analyse and eventually propose solutions for the incompatibilities and contradictions that certainly are present in the vision of philosophy we may obtain, respectively, from Wittgenstein and Brandom. The manuscripts can be submitted in Spanish, English and Portuguese. In case you wish to submit a writing in German or Italian, we offer translation into Spanish and publication in bilingual form. Submissions will be subject to blind peer review and must meet the usual standards of quality for international Publications. If the idea appeals to you and you wish to participate in our special edition, we just need you to provide us with a title, an abstract​ (max. 200 words), ​and 3-5 ​key words. Deadline for the receipt of submissions: 30/09/2017. Disputatio. 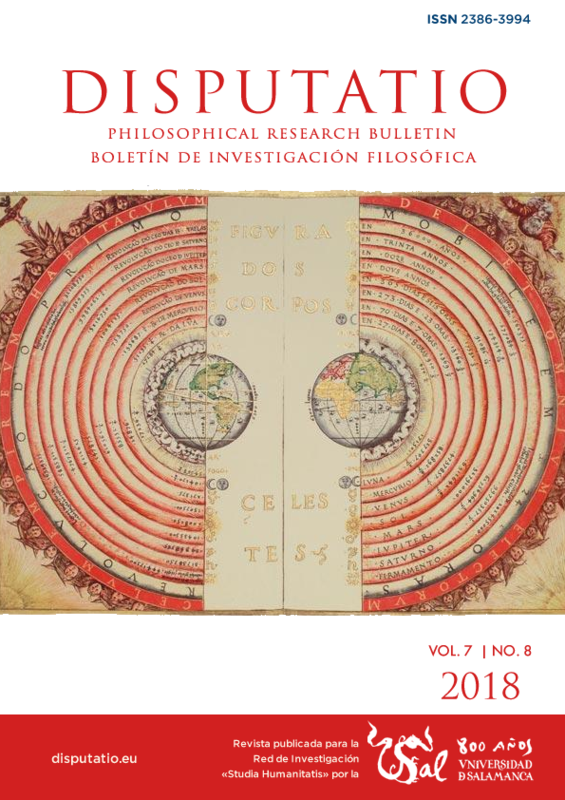 Philosophical Research Bulletin its published by the University of Salamanca (Spain) and follows the standard academic procedure of revision of writings by peers; it is of open access, free of charge for authors and readers, and it mainly publishes original writings in Spanish, English and Portuguese. Disputatio has been given the B category by the CIRC [EC3METRICS – University of Granada] in 2017, the B1 category by the Qualis/CAPES at the period 2013-2016, and the Level 1 INT by the The Nordic List and The Finnish List in 2017. Disputatio (ISSN: 2254-0601) is covered by the following indexing services: The Philosopher’s Index, MLA International Bibliography, ISOC (CCHS-CSIC), International Directory of Philosophy (PCD), Regesta Imperii, ULRICH`S (ProQuest), PhilPapers, DOAJ, LATINDEX (Catálogo), Dialnet, Google Scholar, among others. Further details can be found on the official website: https://disputatio.eu/. For more information, please feel free to contact: Kurt Wischin, Universidad de Granada, Spain (kurt.wischin@gmail.com). Guest Editor.